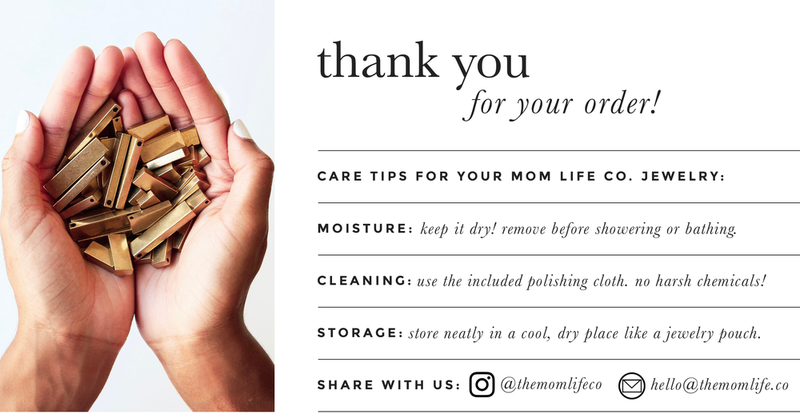 Brass Jewelry Care — The Mom Life Co. Raw brass tarnishes quickly when introduced to water. So while you may always keep your rings on to shower, you'll want to take your custom Mom Life Co. necklace off first. What about perfumes, lotions, oils and/or sweat? You'll want to add your necklace as the last step in your getting ready routine, to avoid product grease or buildup. We also love that our chunky brass bars are naturally heavy, so you may want to remove or tuck it in while working out. Simply store it in a clean and dry place. The pouch that it came in or hanging on a jewelry stand are both great options but sitting on the humid bathroom counter near the sink is not! For when your piece just needs a little love. This wipes away everyday build-up, and restores a little life back to your jewelry. Always store in a cool, dry place. This will remove any tarnish, and you'll have a nice shine afterwards. Always choose a jewelry polishing similar to the one included in your package vs a harsh jewelry cleanser. A small piece goes a long way and you can keep using it over and over. You can find our favorite here! For when you haven't cleaned it in a while and you notice any super dark tarnish forming. Mix 2 tablespoons of baking soda with a few drops of lemon juice until you have a good paste. Apply the paste to your piece with an old toothbrush and scrub. Let it sit for up to 15 minutes, rinse with water and dry thoroughly.